The ashram where I am staying received an interesting visit from a group of about 25 Korean students from the department of Yoga Studies and Meditation, Wonkwang Digital University. They were accompanied by department head, Jongsoon Seo, Ph.D., Prof. Kamalakar Mishra, now retired professor at the Benares Hindu University, and by Raghavendra Adiga, their yoga asana teacher. Kwak Seung Hyun (Hamsa), another teacher at Wonkwang, is a disciple of Swami Veda and a frequent resident here. He is currently writing his Ph.D. thesis on “The Evolution of Pranayama in Yogic and Tantric Texts” at Gurukul Kangri University in Haridwar. Prof. Jongsoon Seo is a student of Kamalakar Mishra and spent ten years in Benares, where she completed her doctorate on “The Theory of Sakti in Kashmir Saivism.” She speaks fluent Hindi, much to the delight of the Hindi-speaking residents of SRSG. Under her leadership, the Wonkwang Digital University yoga and meditation department now has an amazing 400 students. Such trips to India are a part of the university department's regular agenda. Since it is an on-line university, the students get little opportunity to interact personally with the teachers and other students. (It is interesting how such things as yoga and meditation can be taught on-line. I will have to ask.) This group had just spent a two week retreat at the Kalyana Baba ashram in Almora, and were passing through here on the way back to have a certificate bestowal ceremony, etc., since those things are coming through the Association of Himalayan Yoga and Meditation Societies International (AHYMSIN), which is here. 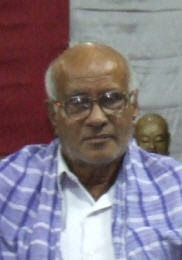 Kamalakar Mishra, teacher of Kashmiri Shaivism at BHU, who calls himself an Indo-Korean professor due to his relationship with the Korean university, where he has been in residence, is a well-known scholar of the Kashmiri Saiva tradition, with numerous publications to his name, such as The Significance of The Tantric Tradition, Varanasi (1981) and Kashmir Saivism: The Central Philosophy of Tantrism. I don't know whether Kashmiri Shaivism is having a renaissance thanks to Muktananda Swami, but there is certainly quite a bit of interest in it these days, specially around here. Prof. Mishra recounted some of his experiences with Swami Rama, whom he met for the first time 35 years ago in Rishikesh at the Sadhana Mandir. He spoke with vigor and ease, despite his 75 years. I present some of the things he said, for information purposes only. The chance to associate more extensively with Swami Rama came in 1985 when he was invited to Honesdale to the Himalayan Insitute to speak on Kashmiri Shaivism. Prof. Mishra said of Swami Rama that he possessed the two outstanding qualities that are found in all spiritual teachers: egolessness and love, or maitri bhavana. In fact, these qualities are related to one another. Ego or selfishness, is like an obstruction. The Divine wants to flow through us all, but the ego blocks it. When one is beset by ego, then he things the individual me is the only me, and not that he is present in all others. The more the ego melts, the more the love naturally and spontaneously flows thrugh our hearts. With that, the sadhaka feels that all creatures are his own. This is what you call love, maitri-bhavana. And the other way around, the more one practices maitri-bhavana, the more the ego melts away. For us, since it does not come naturally, we have to practice. When it is realized, then it flows naturally and spontaneously. This love is the very nature of the universe, and one who has come to this sense of identity with the divine, he gives this love freely; it is not given to a chosen few, but extended to all. The evening then went on with the distribution of certificates and the singing of songs in Korean and Hindi, and concluded with the chanting of the evening prayers in Sanskrit.